The drivers license issue, Uighurs, Stop List, upcoming America’s Cup, and the U.S. Consulate’s relationship with the Bermuda Government were among the topics discussed when US Consul General Mary Ellen Koenig sat down with guest interviewer Jeremy Deacon for our latest live interview on our Facebook page. When asked about the recent issue with some Bermuda drivers licences not being recognised in Massachusetts, Ms Koenig said,”We were all surprised and taken aback and what does that all mean, and in unraveling it, it became pretty clear to me what was going on. ”So I think what happened is, in Massachusetts they were tightening up their regulations and all, and they realized that Bermuda was not a signatory, which is what governs our right to drive anywhere in the world. 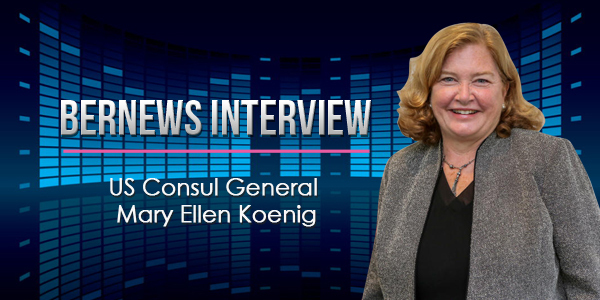 Asked about the types and amount of services the Consulate provides in a typical day, Ms Koenig said,”It depends. We have a very busy consular staff and they’re dealing with American Citizen Services. “But we’re also dealing with the influx of American tourists, and obviously, that’s a big deal here in Bermuda, coming by cruise ships, coming by airplane. We will have deaths occasionally, which we have to deal with the officials. Asked if the U.S. Consulate has played any role in the upcoming America’s Cup, Ms Koenig said,”We’ve been involved just on discussions on the security front. We’ve had military people in, just to give some thoughts and some guidance, some suggestions. ”We also know that the Coast Guard is going to be around in the region,” Ms Koenig added. “And that will be helpful. They will be landing, taking a port call, in St. George’s at some point during the Cup. Asked about the circumstances surrounding the Uighurs, Ms Koenig said, ”We remain interested in seeing it resolved, but I know that it’s not resolved yet. It really is a matter of getting the proper paperwork done and that does rest with the UK Government. Speaking on the Stop List, Ms Koenig said, “This is a world-wide policy, when somebody runs afoul of crime, in their country or in the US, that makes them ineligible to travel to the US without getting a waiver of that ineligibility. So yes, if somebody is convicted of a crime here in Bermuda, that does make them ineligible. ”The good news is that there is a process for overcoming that ineligibility. It takes some time, and it takes showing that you have turned away from whatever it was that was problematic in the past, whether it was drug use or, you know, whatever the crime was. “It’s not going to happen, somebody’s convicted of a crime and,’Oh, well next year I’m gonna go to the US.’ I mean, you have to be able to prove your eligibility to a Visa Officer, and actually to the CBP officers at the port of entry, that you are eligible to enter the US. So that’s it. ”We have a really special relationship with Bermuda, and Bermuda is one of only two countries, Canada and Bermuda, that can travel to the US without visas or without going through some of the other programs we have, so it is a special relationship and it’s a special privilege. Ms Koenig said,”In terms of our relationship with the Government, they’re very accessible, they’re very generous with their time, so when something comes up, we are able to get in and talk about it and try to figure out what the resolution is. It’s very amicable. ”I think it really goes back to the relationship between Bermuda and the United States. It’s 400 years of history. It’s all of the connections, the economic ties, the family ties, educational ties, there’s so much that binds us. Question: Why does the crime of DUI, a serious offense clearly involving a higher degree of ‘moral turpitude’ than merely possessing a joint or a seed, conveniently not qualify someone for entry to the stop list? Why are people on the ‘terror watch list’ allowed to fly (the ‘underwear bomber’ and the ‘shoe bomber’ for example) when someone on the stop list for petty ‘crime’ from “the place where there is the warmest relationship between the host country, here, Bermuda, and the United States.” is completely ineligible for entry for 99 years unless you are able to buy a waiver?